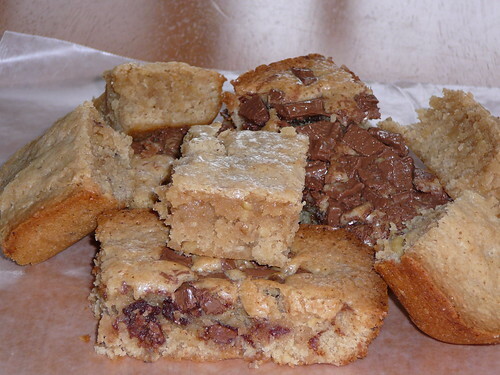 Did you know that there was a blonde brownie day? Neither did I, but there it is and it happens to fall on today – January 22. I found this tid bit of info out while surfing around the web looking for random food intell. While it is not a national holiday I thought celebration of the brownie in either form to be wonderful inspiration for a morning of baking and a chance to learn some food history. 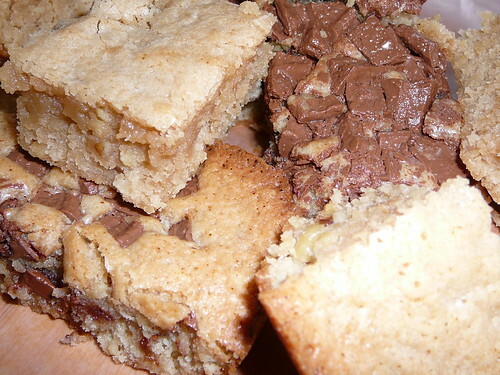 “Blondies” are thought to have been baked and enjoyed before the brownies full of chocolate flavor we love today. Food historians believe this based on cookbooks. I bet you have never considered your collection of cookbooks to be a contemporary historical of the gastronomical enjoyments of our time – but it truly is. These aged cookbooks show the major ingredients of “blondies” were butter, and brown sugar – like the components of butterscotch candies which were well enjoyed in the mid nineteenth century. There were cookbooks whose directions showed a mixture of butterscotch candy ingredients mixed with flour and a leavening agent. Historians seem to agree that chocolate flavored brownies came into popularity in the twentieth century’s start when mass production of cocoa and chocolate became widely available and much more affordable. Knowing all of this I sat down this morning and wrote a recipe for Blonde Brownies that I really like. The smell was delicious in the house and the taste was fantastic. Butter and flour (I use the Crisco + flour spray) an 8×8 cake pan and set aside. Combine the butter, mascarpone, and milk in a sauce pan over low heat (I use a heat diffuser to ensure that the dairy products won’t scorch) till butter and mascarpone melts. Once this happens remove from heat. Add the light brown sugar (you can use dark but I enjoy the light color maintained by the light color of the sugar), beaten egg, and vanilla until combined thoroughly. Combine the flour (minus the one extra tablespoon), baking powder, and salt into the now wet sugar mixture. Take the extra tablespoon of flour and toss with the walnuts (I picked this up from Ina Garten that this will help suspend the nuts or chocolate evenly throughout). Now incorporate the nuts and flour into the mixture. Stir well. In half of my brownies I placed the chopped chocolate on the top of the brownie for my friend who enjoys chocolate mixed into her “blondies” as many people do. I wanted mine “pure”. Bake for 25-29 minutes based on your oven – of course check for a clean toothpick or knife. Let the pan cool and then slice into bars or 2x2s. So make brownies blonde or otherwise and enjoy – after all it is a holiday. 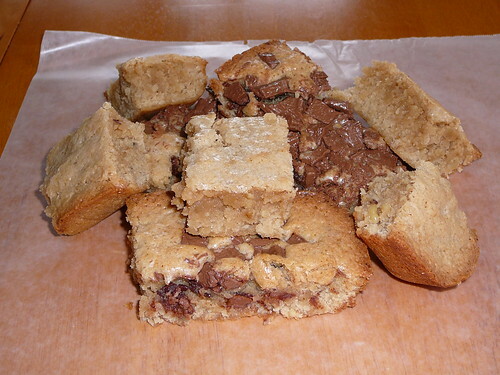 Thanks to http://www.foodtimeline.org/foodfaq.html#blondies – for the history facts. This entry was posted in Blonde Brownie, brownies, chocolate, cooking, delicious, dessert, Food, food pictures, recipe, Uncategorized. Bookmark the permalink. Wow who knew history could make a person so hungry. I hate history normally but this was actually fun to read and try to make. What yummy brownies. Great recipe thanks. Thanks for the positive feedback on the recipe. I’m glad that you enjoyed it. They really were, very rich. I thought the chocolate was a bit too much but my friend who is the chocaholic said it was great. Your blog looks good for starters. I will check back to see what you are up to! Thanks. I would appreciate it.